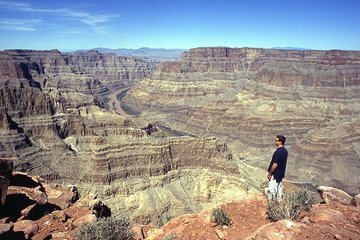 Soar above the Grand Canyon’s magnificent west rim on a full-day airplane and ground tour from Las Vegas with an optional upgrade to stroll the Grand Canyon Skywalk. Take in aerial views of the Hoover Dam and Lake Mead, and get a glimpse down into the colorful Virgin Canyon. Experience the sweeping panoramas from Eagle Point and Guano Point, dine at a canyon-side restaurant then board a return flight to Boulder City with transfer to your Las Vegas hotel. Inclusive of all local taxes and fees! arrived very early at grand canyon to avoid the heat of the day but there was nowhere to get a drink at that time of day. Restaurant nor coffee bar were open. neither was The Ranch. however the bonus was the skywalk was empty! so plenty of time to gain confidence to attempt to walk around it. Plane flight was lovely but the views over the canyon rather than around it would have been nicer and the Hoover Dam wasn't even pointed out so I didn't get to see it as it was only visible from one side of the plane and on the way back we went a different way so I missed it altogether. for the price we paid I don't think it was value for money. Shame as it was to be the event of our Vegas trip. Glad we did it though!!!!!!!!! PS Helicopter is the way to see canyon but my partner wouldn't fly in one.